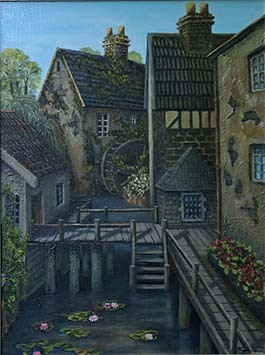 The second of a pair of paintings depicting water mills. The idea came from an old photo of mills I took while travelling in France in the 1980s. In this painting I tried to create a sense of a community of buildings grouped around the function of running a mill. Note: Price includes delivery within Melbourne, Vic. Australia. For Delivery cost outside Melbourne contact Anne Newman (anewman@netspace.net.au) Not available for overseas sale. Note: Price includes delivery within Australia. Not available for overseas sale. Note: Price includes delivery within Australia. Cost of delivery to all other places is additional.